SteelSeries has introduced a new Rival 650 wireless gaming mouse, alongside an updated wired offering. The Rival 650 uses what the company calls a ‘Quantum Wireless’ 2.4GHz system, which features 1000Hz polling – meaning the device reports its position every millisecond to ensure a low level of latency. In other words, ditching the cable and going wireless doesn’t have to mean a laggy gaming experience. This is also the first wireless mouse to utilize the TrueMove3+ dual sensor, a 12,000 CPI (counts-per-inch) affair that SteelSeries introduced with the Rival 600. In our review of the latter, we found this system ensured a high level of tracking accuracy, with the second sensor stopping drifting from occurring whenever the mouse is lifted off a mouse mat or surface. A further boon is fast charging capability, allowing users to plug in the Rival 650 to a USB port for a quick 15 minute charge and get over 10 hours of battery life. In a pinch, even a quick five minutes will give you three hours of mousing longevity. Inevitably, you also get 8-zone RGB lighting. The Rival 650 is available now direct from SteelSeries for $119 or £115 (around AU$210). 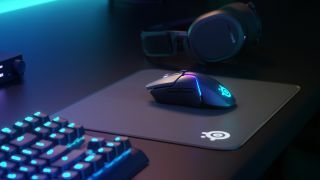 If you want a wired (and slightly more affordable) mouse, then you may be interested to learn that SteelSeries has also launched the Rival 710. This builds on its predecessor, the Rival 700, a modular gaming mouse that was full customizable. Users can swap out the Rival 710's sensor, cable and even an OLED display on the side (which can show notifications or custom graphics such as an animated GIF). It also employs tactile feedback as alerts to tell you, for example, when you’re low on health. The Rival 710 also adds the TrueMove3 sensor into the mix for better accuracy, coupled with an improved switch rated to 60-million clicks for durability, so those buttons should last longer. SteelSeries is selling the Rival 710 for $99 or £99 (around AU$180).